I’m bringing up the tail for Drink Week with a break from my friends’ delicious boozy summer fun. 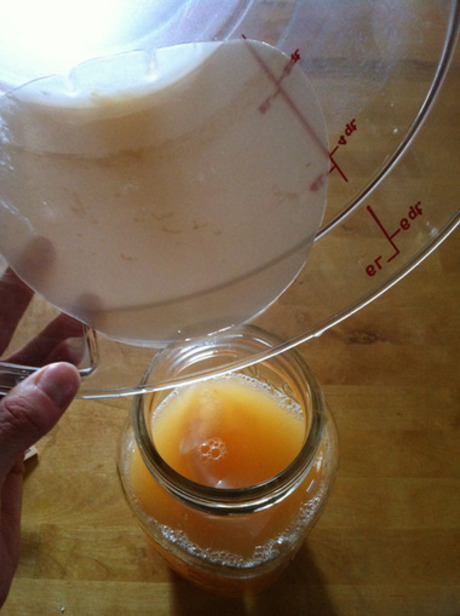 This is a fermented tonic, good for your belly. Good also for marinades, salad dressings, a fridge pickle or anywhere else you’d splash some vinegar. This recipe is based on the instruction and ratio for fruit scrap vinegar from Sandor Katz in his books Wild Fermentation and The Art of Fermentation. 1. Place peach peels and/or scraps from soft or bruised areas in a wide-based glass, ceramic bowl or food-grade plastic container. Avoid metal bowls or containers. 2. Dissolve 1/4 cup sugar in 1 quart water, pour over the scraps and repeat that ratio/process as many times as needed to give you one part scraps to two parts liquid. You can use honey here, but it will take longer for the fermentation to get started. 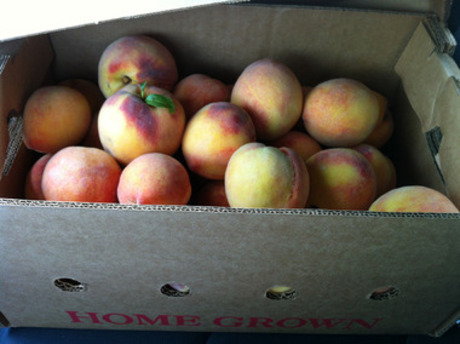 The goal is to create a peach alcohol, which will happen when the yeasts on the fruit eat the sugar. 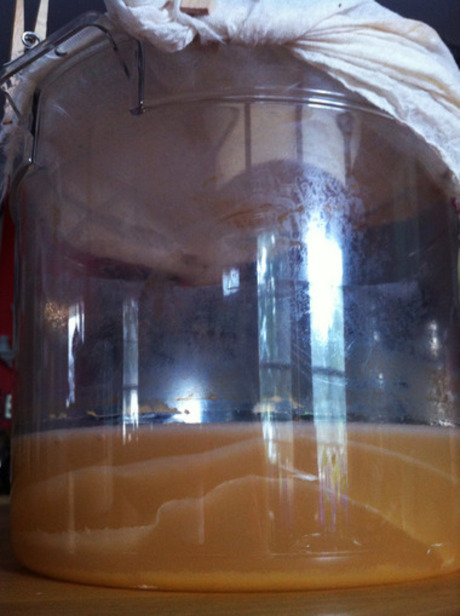 The alcohol is then converted to acetic acid in the second round of fermentation. In the end of the process, you’re not really drinking/eating the sugar at all. Cover the bowl with cheesecloth or a thin dishcloth. Stir the scraps daily to allow for the bubbling that will occur as the yeasts eat the sugar and to prevent surface mold from growing. 3. After one week, strain the scraps from the peach juice and pour the liquid back into the same bowl (you can wash it in between). Add a splash of a raw vinegar, like Bragg’s Apple Cider vinegar to help get the acetobacter started (if you don’t have any on hand, then omit it entirely). Cover again and let sit for another two weeks—stirring every few days at first and then swirling the bowl gently as the ‘mother’ forms on the surface of the liquid. The vinegar is finished when it smells and tastes like vinegar, around the end of the two-weeks. 4.Pour the vinegar (and ‘mother’) into a large jar and cap tightly. Store at room temperature, where it will keep indefinitely. The vinegar will age nicely and develop a more complex flavor. I drop the mother from various flavored vinegars right into new batches, which helps things get going faster and smoother (though it’s not necessary, since the mother forms itself and reproduces herself anyway). and fill the rest of the way with cold club soda. Read about the benefits of raw, fermented vinegar here, sip your tonic and feel good about yourself!